By MILTECHREV Editors including Tom Demerly with Assistance from T. Policastro. Tactical Performance Corporation's new A-TACS Combat Shirt Gen II uses a unique combination of fabrics, integrated protective pads and all-over A-TACS print to produce a very sophisticated combat shirt design. Tactical Performance Corporation of North Highlands, California has shown pre-production prototypes of their new A-TACS Tactical Combat Shirt Gen II. We had the opportunity to test and evaluate the full uniform, including the Combat Pants for three weeks in November and early December. The evolution of the combat shirt has been a rapid one driven by requirements of operators using new load carrying systems like tactical and load bearing vests and the inclusion of body armor into the soldier’s uniform. Old BDU’s didn’t work with load vests, tactical rigs and armor. As the combat shirt has gained acceptance better adaptations of the early designs have emerged. This example from Tactical Performance Corporation represents the pointy end of the bayonet in combat shirt evolution. From the top of the shirt the neck is 3.75 inches (9.5 cm) high at its highest point. There is an 8 inch (20.5 cm) zipper at the front of the neck that opens the collar and extends downward into the torso. The stand-up collar is 50/50 NYCO NIR (Near Infra-Red) VAT print Ripstop fabric as is the entire upper section of the shirt except the fabric covering the molded impact pads at the elbow, upper arm and shoulder. These padded sections are covered in lightweight, abrasion resistant synthetic that mimics the feel of Cordura. Cuffs on the sleeve have velcro adjusters and the abrasion resistant fabric over the elbow pads extends down the forearm nearly to the cuffs, a nice feature for protecting the shirt (and your arms) when in the prone position. The lower sleeves feature a three piece articulated pad of 8mm thick EVA foam and a reinforced section of coated fabric with the texture and weight of Cordura for abrasion and wear resistance. A key feature of the entire shirt is the VAT print fabric. 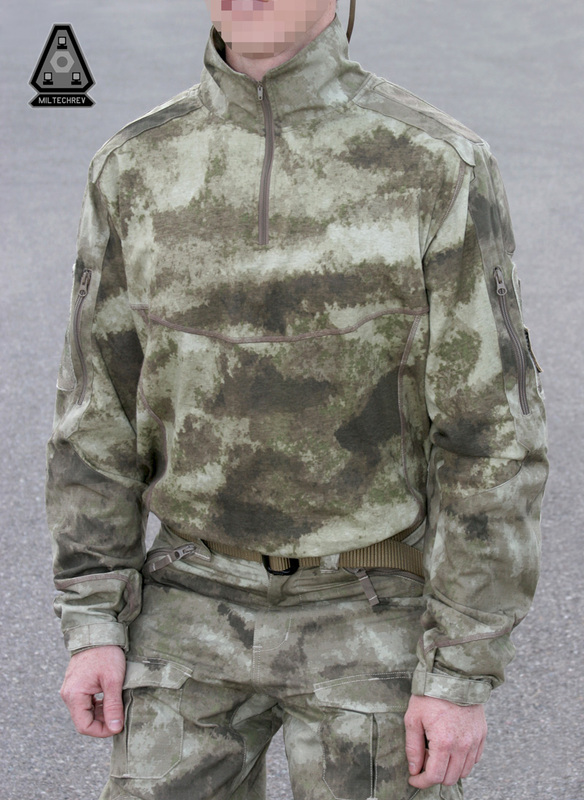 This process is more expensive than other techniques for imprinting fabric with a camouflage scheme and cause the appearance of the garment to remain fresh after hard wear and repeated laundering. The VAT print adds significant life and value to the uniform. 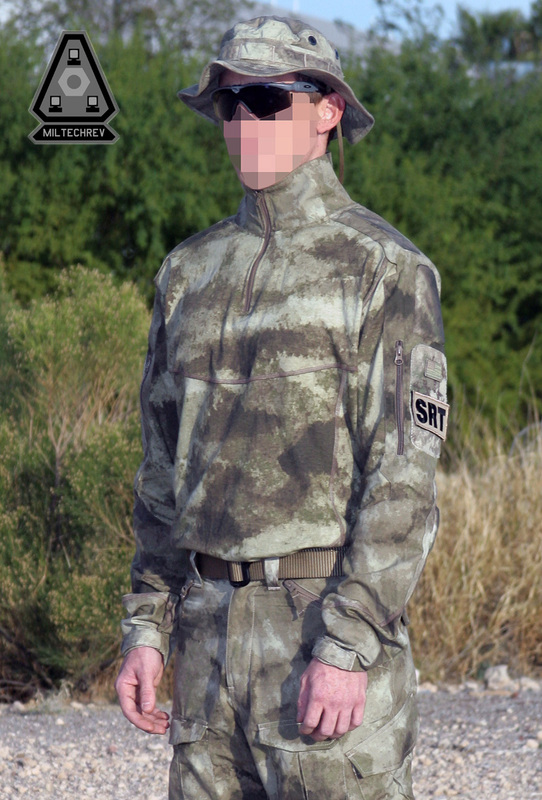 Early generation combat shirts usually only had camouflaged shoulder and chest sections with the torso being a solid color. The presumption is your load bearing vest covers the solid color part of your body. Not only did it look odd, like a BMX jersey, but it didn’t work very well for concealment either. 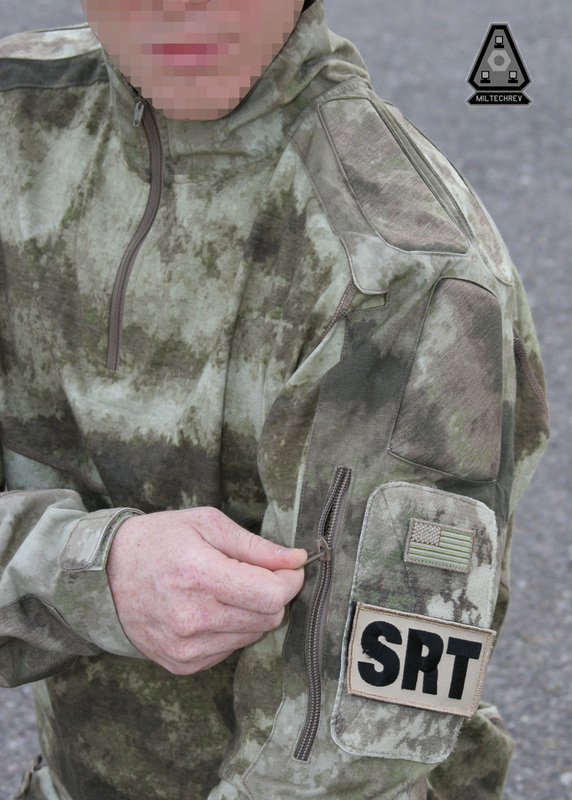 Tactical Performance is one of only a handful of tactical vendors extending the camouflage scheme over the entire combat shirt. If you study the philosophy behind the A-TACS concealment concept it includes the idea that all of the operator’s equipment, including weapon, be A-TACS pattern to maximize visual stealth. This concept is valid not only for concealment but also so opposing forces cannot quickly tell what position an operator is in at the instant they visually acquire them. That split second of visual disorientation coud be just the amount of time needed to get the first burst off, and the difference between who walks away. 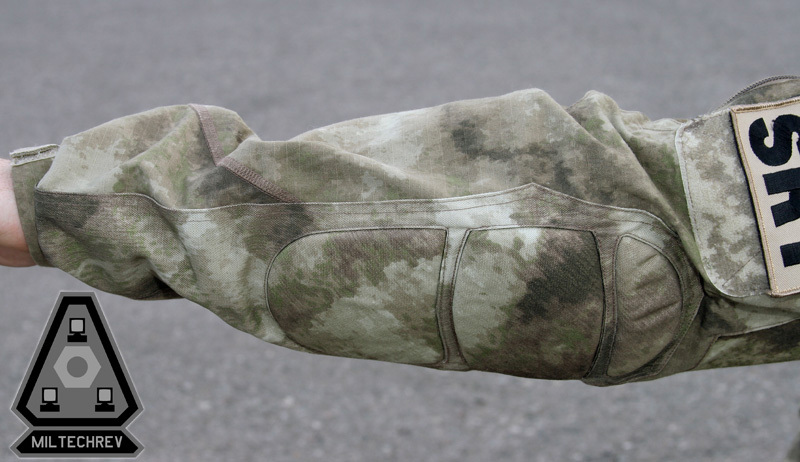 Unlike other combat shirts the entire garment uses the A-TACS concealment pattern for better visual stealth. The six innovative padded sections (in addition to the elbow pads) perform a few functions. The elbow pads are obvious, protecting the forearm and elbow while in the prone position. Above the A-TACS patterned velcro patch panels there are three more padded sections per side. The upper arm area is useful for leveraging anything with your shoulder and for protection while riding in a cramped armored vehicle like a Lenco or Up-armored ASK Humvee. The top two pads provide cushioning under the crushing weight of a big ruck. 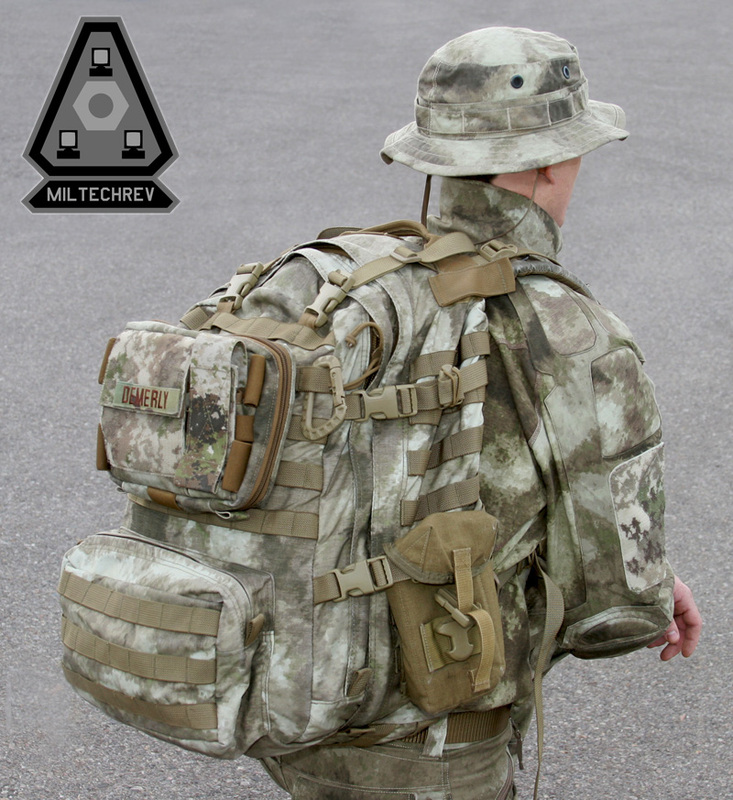 Even though the weight in a big ruck should be supported by the hip belt if you set up your gear correctly there is still a lot “stuff” pressing into your shoulders when you combine your tactical rig with a big ruck. The two pads on the top of each shoulder take the edge off that pressure. The padded sections are 8 millimeters thick and made of flexible closed-cell EVA foam sewn into the abrasion resistant fabric. Articulated 8mm EVA foam ergonomic pads are built in as bump and abrasion protection at key areas. We found the pads did not make the shirt perceivably hotter even up to 100 degrees Fahrenheit. 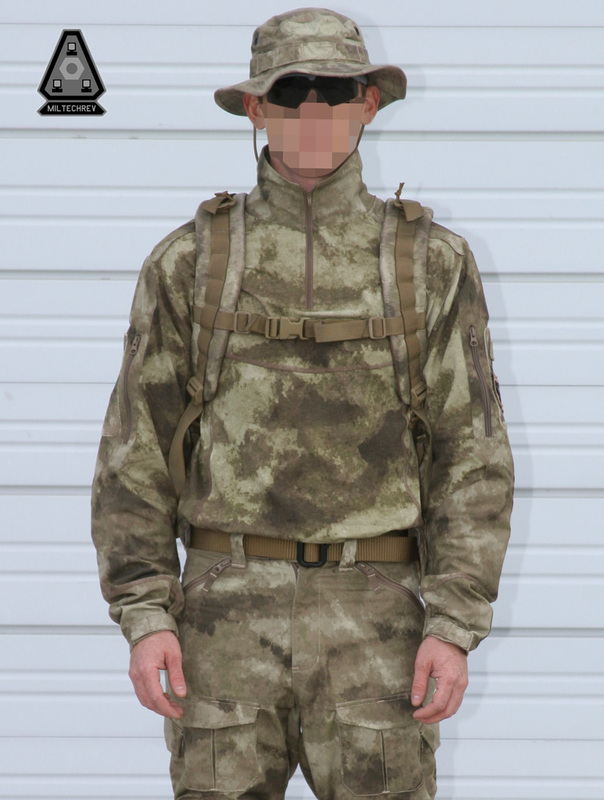 Patterning on the shirt includes three separate panels on the back to facilitate carrying a large tactical pack and wearing load bearing vests and body armor. The points where the load is concentrated have no seams. There are separate side panels and two panel construction on the front. The torso is a total of seven separate fabric panels not including the NYCO 50/50 ripstop shoulder/arm section. Joining these panels is flat seam, quad stitching that lays flat and is very precisely executed. The torso section below the upper ripstop shoulder and arm area of the SH-0200AT Tactical Combat Shirt Gen II is A-TACS patterned 100% cotton (no melt) 5.5 ounce per square yard fabric. This fabric is cool and comfortable in a hot/dry climate. The pads on the shoulders reduce the pressure of pack straps and help keep the straps in place on your shoulders. We got to wear the prototype of the Tactical Combat Shirt Gen II in a wide temperature range from upper 30’s Fahrenheit to nearly 100 degrees Fahrenheit (welcome to the desert…). My first impression was that the padded sections did not make the shirt hotter at high temperatures approaching 100 degrees. I was impressed by that. Perhaps the pads are small enough individually that they don’t trap enough heat to make a big difference. The fit on this prototype is very good. I initially thought the neck could be larger, and perhaps it could be for larger wearers. I don’t have a large neck like some guys who spend more time in the weight room (Marines…). On me, it was “tailored” and precise. This high neck can also be worn unzipped and folded down like a flat collar. I would like to see a zipper longer than 8 inches so the shirt could be removed over a tactical bump helmet. As it is, if you are going to remove your shirt you need to pull off your bump helmet. It won’t fit through the neck opening when unzipped. Admittedly, this is a nit-pick, but I have seen one tactical shirt that had a full front zip and I liked that idea for easy donning and removal without having to sort out your helmet, goggles, comms gear, etc. One shoulder pocket is built onto each sleeve. 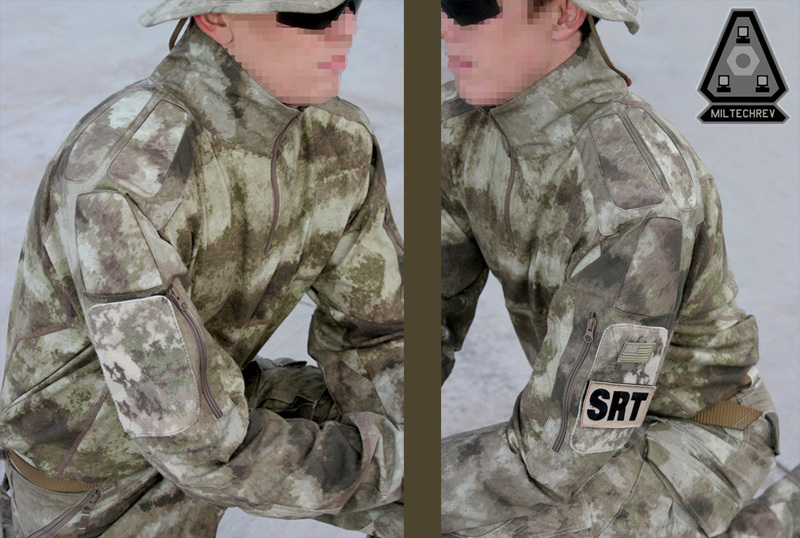 Notice the A-TACS camo patterned Velcro pile on the patch panel, a detail missing from many camouflage tactical shirts. In general the fabric and attention to detail on this tactical shirt locate it above versions we’ve seen from many other tactical vendors. It is the nicest we’ve worn. Tactical Performance Corporation has carved out a niche of making very evolved, high-end tactical uniforms with refined features missing on other brands. Some of their items are ready-made versions of popular uniform modifications that previously had to be done by private tailors specializing in uniform modification, a process that is slow and expensive. Tactical Performance has brought those modifications to the production tactical market. We are continuously impressed by the designs and construction of Tactical Performance Corporation’s uniforms and this new example of their upcoming A-TACS Combat Shirt Gen II continues that level of workmanship and performance. Tactical Performance Corporation's A-TACS Tactical Combat Shirt Gen II with full A-TACS patterning including body and velcro patch panels, integrated shoulder and elbow pads and application specific fabric for user comfort and function. « Boonie Bust Up: A Tale of Seven Boonie Hats.